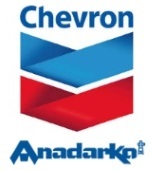 édité le 13/04/2019 - Plus de news de "CHEVRON" - Voir la fiche entreprise de "CHEVRON"
Chevron Corporation announced that it has entered into a definitive agreement with Anadarko Petroleum Corporation to acquire all of the outstanding shares of Anadarko in a stock and cash transaction valued at $33 billion, or $65 per share. Based on Chevron’s closing price on April 11th, 2019 and under the terms of the agreement, Anadarko shareholders will receive 0.3869 shares of Chevron and $16.25 in cash for each Anadarko share. The total enterprise value of the transaction is $50 billion.
. Shale & Tight – The combination of the two companies will create a 75-mile-wide corridor across the most attractive acreage in the Delaware basin, extending Chevron’s leading position as a producer in the Permian.
. Deepwater – The combination will enhance Chevron's existing high-margin position in the deepwater Gulf of Mexico (GOM), where it is already a leading producer, and extend its deepwater infrastructure network.
. LNG – Chevron will gain another world-class resource base in Mozambique to support growing LNG demand. Area 1 is a very cost-competitive and well-prepared greenfield project close to major markets. - Significant Operating and Capital Synergies: The transaction is expected to achieve run-rate cost synergies of $1 billion before tax and capital spending reductions of $1 billion within a year of closing. - Accretive to Free Cash Flow and EPS: Chevron expects the transaction to be accretive to free cash flow and earnings per share one year after closing, at $60 Brent. - Opportunity to High-Grade Portfolio: Chevron plans to divest $15 to $20 billion of assets between 2020 and 2022. The proceeds will be used to further reduce debt and return additional cash to shareholders. - Increased Shareholder Returns: As a result of higher expected free cash flow, Chevron plans to increase its share repurchase rate from $4 billion to $5 billion per year upon closing the transaction. Credit Suisse Securities (USA) LLC is acting as financial advisor to Chevron. Paul, Weiss, Rifkind, Wharton & Garrison LLP and Shearman & Sterling LLP are acting as legal advisor to Chevron. Evercore and Goldman Sachs & Co. LLC are acting as financial advisors to Anadarko. Wachtell, Lipton, Rosen & Katz and Vinson & Elkins LLP are acting as legal advisors to Anadarko. Chevron Corporation (NYSE: CVX) is one of the world's leading integrated energy companies. Through its subsidiaries that conduct business worldwide, the company is involved in virtually every facet of the energy industry. Chevron explores for, produces and transports crude oil and natural gas; refines, markets and distributes transportation fuels and lubricants; manufactures and sells petrochemicals and additives; generates power; and develops and deploys technologies that enhance business value in every aspect of the company's operations. Chevron is based in San Ramon, Calif.
Anadarko Petroleum Corporation’s mission is to deliver a competitive and sustainable rate of return to shareholders by exploring for, acquiring and developing oil and natural gas resources vital to the world’s health and welfare. As of year-end 2018, the Anadarko (NYSE: APC) had 1.47 billion barrels-equivalent of proved reserves, making it one of the world’s largest independent exploration and production companies.